Georgia Clubb overcame her fear of Scorpions with knowledge and first-hand experience that was motivated by fear and desperation. Since 1999 she has worked with thousands of residents, helping them keep scorpions out of their own homes. Hello! I’m Georgia Clubb, the founder of Seal Out Scorpions. After overcoming a ten year phobia of scorpions and curing my once infested home, William, Mike and I started working with others to keep scorpions out of their homes. We help residents in Scottsdale, Chandler, Gilbert and throughout the Phoenix Metro East and West Valley areas. Bark scorpion populations continue to increase due to many environmental factors, as well as the ‘Go-Green’ movement and the EPA banning of harsher insecticides in the U.S. Therefore, we partner with residents to create personalized strategies to lower and break the neighborhood population flows to their homes, rather than the traditional method of simply trying to kill individual scorpions with chemicals. Christopher Clubb pictured at 3 in the first “Scorpion Home”. I grew up in the East Valley and didn’t know we had scorpions in the city, let alone that scorpions got into homes, until William and I purchased our first house in Tempe. After moving in, Mike (who was a kid at the time) found our first scorpion in the kitchen sink. We averaged 5-10 scorpion sightings per year and worked with a number of pest control companies to no avail. I lived in constant fear of the creatures, driving William (and myself) crazy with my anxiety. In our fifth year in the home I got stung in bed. We had just adopted our first son Christopher, who was 2 ½ years old at the time. His head had been lying on my arm and at first I thought my arm had just fallen asleep. I soon realized from the intense pain that I must have been stung… and that it had to have been crawling next to Chris’ face. Frantically, William and I searched for it in the bed, just to find it 10 minutes later on my night shirt. I was traumatized, packed-up Chris and moved in with Mom and Dad at 2 o’clock in the morning. After being stung, I left my home and never stayed another night there! Ashley Clubb pictured at 4 in the third “Scorpion Free Home” that I wished we would have stayed in. I lived in my second home for two years, but again moved out because of scorpions. The problem was not as bad as the first home’s, but I still didn’t feel our pest control efforts really worked. We’d only found a few in the house, however we were in the process of adopting Ashley, our second child, and I was terrified of another sting or scorpion in one of our beds. William had wanted to move to Ahwatukee, but I wouldn’t consider it after learning of the scorpion problem in the area. So, we purchased a home close to the neighborhood I grew up in and where I felt safe from the threat of scorpions. We lived there scorpion free! The property never seemed to need pest control, fear of living in my home went away and the scorpions fell off my radar. Timothy Clubb pictured at 4 and the first day he came to live with us. In the backyard where we once found 60-70 a night, but under control here. Three years later and in the process of adopting our soon-to-be third child, Timothy, we moved just two streets over. The house with it’s large irrigated yard, pool and lush vegetation was perfect for our young family. We toured the home twice with the Home Inspector during the inspection phase and learned that it needed treatment for termites, but nothing ever came up about scorpions, and it didn’t cross our minds to even ask. To our horror, the night we moved in I found 22 dead scorpions around the baseboard and 6 live ones in the basement. The next day was spent on the phone with brokers and attorneys. I wanted to return the home, but quickly learned we were stuck with the house and our only recourse was a settlement for false statements on the Disclosure. That night, we started spraying the home and discovered it was infested with roaches too. The driveway seemed to move as 1000’s of them scurried across the drive to get away from the insecticides. Over the course of two months we had an additional 32 scorpions in the home and we easily found 60 plus each night doing black light searches. The roach problem was taken care of in days by our efforts, but the scorpions for the most part seemed unaffected. I began working with multiple pest control companies, sealing companies and trying do-it-yourself methods. If someone made a suggestion we tried it. Nine palm trees were fully skinned, all plants around the house were removed and a Jacuzzi with deck demolished. We piled mounds of Diatomaceous Earth (DE) around the home. The house was sealed by three separate sealing companies, each doing a bit more. We removed all carpet knowing surely there was a colony underneath it, but oddly enough (we thought at the time) absolutely nothing. I stopped count after settling with the seller and brokers, but guess we had a total of 60-80 in the home the first year. Nothing we did seemed to work. I was terrified living in the home. William, who had never seemed to be bothered by the scorpions in the previous home, was now very uneasy and now having to deal with my fears all over again. Circumstances would not allow us to quickly move. We sold the scorpion-free home to my parents and grandmother at the time. Mike, still in his late teens, moved into our younger household just around the corner from Mom and Dad. I had talked William into purchasing a home that required considerable remodeling and he wasn’t excited about it. We had two young kids, two dogs, a cat, and were in the process of adopting Timothy. We couldn’t pack up and move in with my parents, we weren’t in a position to walk away from the home and I feared the third adoption would fail just from the home study finding us in a scorpion infested house. I felt a great sense of responsibility getting us into this mess. My fear, desperation and sense of responsibility set me on a course of intense study. At first, this was not an easy feat since I was even afraid to look at a picture of a scorpion, let alone study about them. But I forced myself and started with scientific works from ASU’s environmental research center, the University of Arizona’s cooperative education, Purdue University’s pest management studies, along with the works and texts of world-renowned scientists and entomologists dedicated to the research of scorpions. In 2006, with the final phase-out of banned organophosphates and the continually growing scorpion population, my study began including all matters related to insecticides. Initially my goal was to somehow get temporary control around the home so we could sell and get out as quickly as possible. We never moved, still live in the home, still in a very highly populated scorpion neighborhood and I no longer fear living in my house or that constant threat of stings or scorpions in the bed. As much as I have and continue to learn from the scientific community, I would have never fully understood scorpions and how to keep them out of the home, had I not lived through a highly magnified problem and been able to clearly see the patterns due to the vast numbers we dealt with. was my intense study, a property infested with scorpions, a background in contracting and a strong motivation that resulted in me learning how to get and keep scorpions out of the home and begin helping others do the same – from a scientific approach. It was great fear, desperation, frustration and living with the problem for so long that gives William, Mike and I the passion to help, and the ability to empathize with what residents go through. There are solutions! If you find scorpions in your home in Scottsdale, Chandler, Gilbert or anywhere in the valley, or throughout the state of Arizona, give us a call or send us an email. We can help you achieve what we’ve achieved in our own homes and for the thousands of our valued clients. 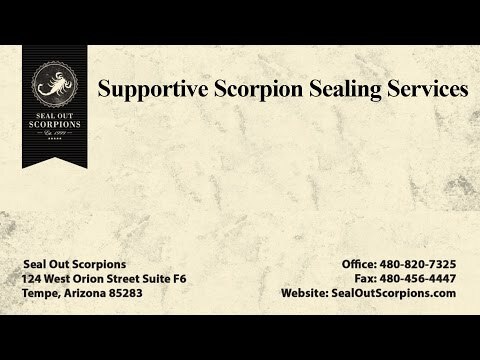 We now offer Arizona homeowners with PayPal Financing for scorpion home sealing services. Even if you live out of Arizona or the Phoenix Metro area, we still may be able to help.